When people say "pecs," they're saying it because it's a whole lot easier to say than "the sternal head of the pectoralis major." But that's what they're actually talking about, whether they know it or not. While the sternal head makes up the meat of the chest, spanning from about the mid-shoulder down to the upper abs, the clavicular head of the pecs — which occupy the space between the top of the sternal heads and the collarbone — make up the "upper" or "inner" pecs. The reality is that most dumbbell exercises that target the chest put their focus on the more prominent sternal pecs, but not all hope is lost — leave it to a few pro trainers to recommend their favorite workouts for challenging your clavs. The time-tested dumbbell fly comes recommended by AFPA-certified trainer Davey Wavey as among the best ways to work the inner pecs (he also recommends the close-grip bench press and cable crossovers on his website). Though you can do chest flyes with cables or a machine, Wavey champions the dumbbell variation. With your back and head flat on a weight bench, knees bent and feet flat on the floor or a pad, hold a dumbbell in each hand so that your arms are extended and the weights are positioned over the center of your chest. Your palms should be facing one another, with the bells almost touching. If you've got a spotter, ask them to hand you the weights in this position. From the starting position, take a breath as you lower the dumbbells to your sides, making an arc with your arms so that they're extended on either side of the chest with your elbows only slightly bent. With a hugging motion that gives your inner pecs a nice stretch, exhale and bring the bells back together over your chest to complete one rep. 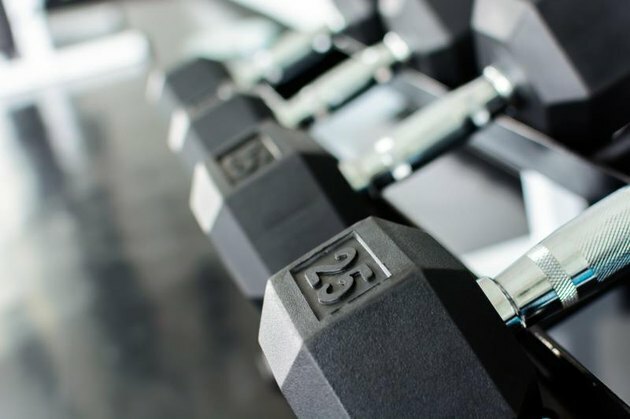 If you've got just one dumbbell — no fancy bench required — MSPT and CSCS Jeff Cavaliere believes that you can give the inner pecs a solid workout with an exercise he calls the dumbbell crossover shrug. This simple movement, detailed on his website Athlean, activates the clavicular fibers with a short, contracted rotation of the shoulders. Hold the dumbbell at your side with an overhand grip, allowing just a slight bend in your elbow. Stand with your back straight and feet shoulder-width apart as you simultaneously rotate your shoulder and wrist toward the inner pecs, so that the dumbbell's bar is horizontal over your thigh. Now bring your shoulder up with a shrugging motion and bring your bicep across your pec until the barbell is right in the middle of your body. Return the starting position and repeat. As with any single-dumbbell exercise, make sure you give each side of your body equal attention by performing the same amount of reps on either side -- you wouldn't want either pec to feel left out. 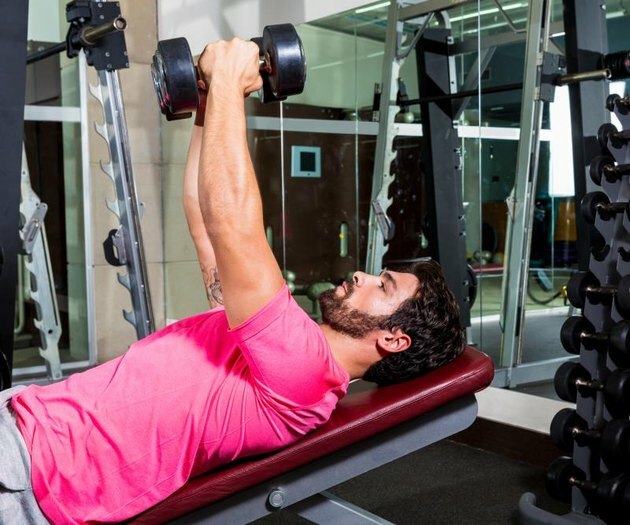 Once you've got flat-bench dumbbell flyes down pat, personal trainer Russ Howe suggests moving the bench into an inclined position to boost your chest muscle engagement, calling inclined flyes the "go-to move" for the inner chest. You can also add a slight twist of the wrist to the top of the movement on your flyes, so that the dumbbells form a sort of "V" when you're holding them aloft. As focus on this these small muscle fibers, concentrate on activating your pecs throughout your workouts — as you push weight, squeeze those clavs together to really engage them. Feel that? It's your clavicular heads saying "thank you for noticing us."